Et tu, Amazon Buy Box? The Buy Box is as old as the Amazon marketplace and is built on a core principle which has survived for decades - many sellers can source the same product. This has been instrumental in bootstrapping the marketplace - brands which didn’t want to sell to Amazon appeared on it thanks to the dozens of retailers who had access to their products for their stores. The Buy Box concept is what built the marketplace, as it allowed retailers to compete with each other on price as if they were all on an infinite retail street. But today the Buy Box sounds increasingly less relevant. It almost sounds fundamentally broken at times. 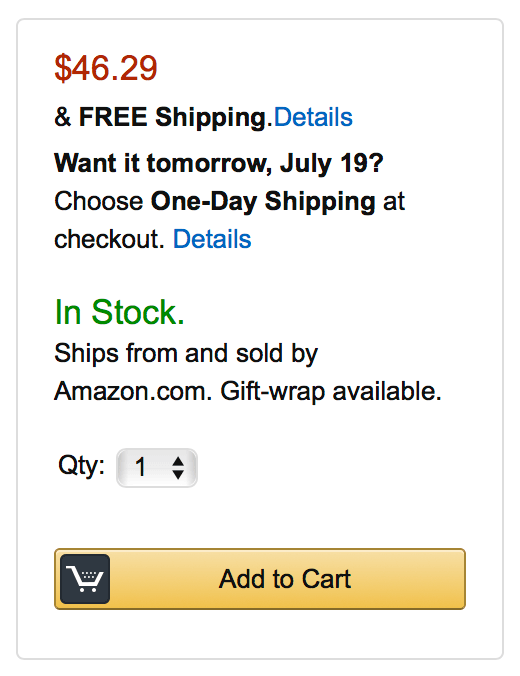 The Amazon Buy Box refers to the white box on the right side of the Amazon product detail page which hosts the “Add to Cart” button. Winning the Buy Box means being the seller selected by the algorithm to get the sale when a customer clicks it. The algorithm decides the winner based on price, quantity available, Prime shipping availability, etc. It tries to present the best option for the consumer. The winner of the Buy Box changes as often as every few minutes as sellers adjust the price to beat the competition. Most utilize repricing software which adjusts prices based on competition and a set of rules. Take, for example, a brand like Adidas. Or Nike. Their products are sold on Amazon by hundreds of sellers. But they are competing for the buy box while sourcing those products at often the same cost. So the winner of the Buy Box is whoever is willing to have the smallest margin, or a seller who was able to buy a closeout inventory. Adidas and Nike most likely have a MAP (minimum advertised price) policy in place too, which means all sellers are forced to sell at an agreed lowest price. The Buy Box is then simply rotating between sellers offering the same thing for the same price. The goal of the Buy Box is that it drives down the price customers pay. But all sellers selling Adidas and Nike products are - as harsh as this might sound - increasing the price of a product without adding much value. They bridge the gap between wholesale brands and a retail channel like Amazon. That’s it. Which of course takes effort, but a product sold by 1, 10, or 100 sellers will have the same price and sell the same number of units. Nowadays most sellers utilize Fulfillment by Amazon (FBA) to store their inventory so it’s not uncommon to see a product sold by a dozen retailers all with their inventory at Amazon warehouses. Before FBA it all made sense, today it sounds ridiculous. And then there is a question of how much a seller is willing to invest into growing a product on Amazon. This involves managing the listing, uploading best pictures, creating great content for the description, and most recently investing into advertising. All of those are required to make the listing successful, and yet the success will inevitably be shared by dozens of sellers. So the answer to how much a seller is willing to invest is - not a lot. This is not great for brands being sold, and raises questions of how well does the Amazon marketplace align incentives for all players involved. This is driving the Amazon Brand Agency market. Brands are waking up to wanting to be well represented on Amazon and realizing that a marketplace of sellers didn’t get them that. This is also why private label has become the area of focus for top sellers. It allows avoiding competition, which in turns allows investing into growing a product without the risk of sharing the success with dozens of other sellers. A reseller can rarely build a moat around their business, they are left to exclusive rights to manufacturers and big discounts enabled by their scale. A brand seller instead can achieve it by growing and maintaining brands they own. The Amazon marketplace was modeled on a traditional real-life retail marketplace. Where customers walk around to find retailers with the best deal for the product they are looking for. Maybe one of those retailers is running a summer sale and has the best price. But in the age of brand building, investing into advertising, and Amazon this model no longer fits. The future of Amazon will likely see a decay of resellers on the marketplace. Instead an increasing amount of brands will be selling directly on the platform, often enabled by agencies. This doesn’t mean the Buy Box is going away. There is actually a new type of Buy Box yet to happen. But this time it’s about the best product, not the best seller. The Buy Box of today and the future is which product is the number #1 search result. This is what matters. The marketplace has shifted from a bunch of sellers offering the same product, to a bunch of sellers offering competing products.